The Garrison Colonial, built in 1966. My parents unbolted the front door of my childhood home in Lexington only for parties. Otherwise, people entered the 1966 Garrison Colonial via a side door. This door, located on a tiny porch that led into the mudroom, was closer to the garage but still outside, so we raced on rainy days. We mostly used the tiny porch for entry and egress. 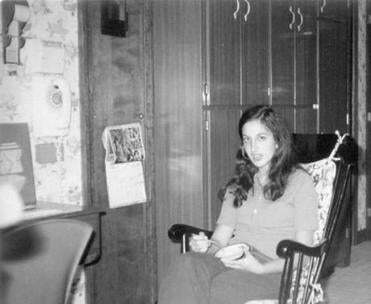 Yet it contains a special memory: Every spring for 45 years, my mother’s annual hanging impatiens contained a bird’s nest — the mother studying our comings and goings like a British Palace guard, and we monitoring her babies’ progress like neonatal nurses. The compact mudroom led into the kitchen of the four-bedroom house — spacious for those days. But as a kid, all I really cared about was my bedroom, with its Beatles posters and gold clanking glass beads covering the doorway during those preteen years — lest anyone enter undetected. 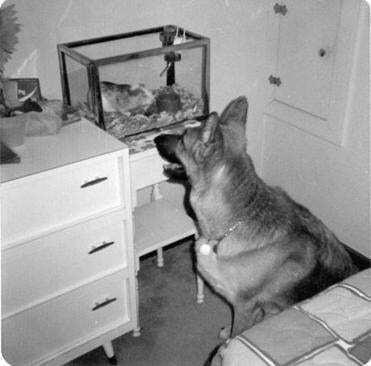 And I felt special that the laundry chute was in my room (used, at times, to plunk my German shepherd’s toys down to tease her, annoying my mother). 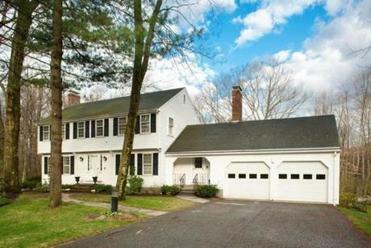 This was home from my formative years through college; eventually, I bought a house in neighboring Bedford, and my older sister raised her family in Andover. My parents remained three more decades and updated twice: the kitchen in the ’70s, augmenting the original brown cabinets with white and oak doors (a mismatched combo, but a popular solution back then), and in the mid-1980s, as part of a large renovation project. They removed bedroom number four to create a two-story entry-hall ceiling. They made the dining room a marble guest bathroom/coat closet and created an expansive dining room out of the living room. Among other changes, they created a colossal great room. Mindy Pollack-Fusi’s parents in the great room on moving day, before the house was renovated. The venerable PBS program renovated Mindy Pollack-Fusi’s childhood home in Lexington, and the stars of the show gave her sneak peeks at its transformation. Designed with high ceilings and a wide sliding-glass door, the contemporary great room also contained an oversized custom-made wall unit with a bar, big television (probably only 32 inches, but huge back in the day), and a sound system with then-trendy toddler-tall speakers. My parents loved to sit in that room reading and listening to symphonies. The ficus in the sunny corner grew to nearly 12 feet high. 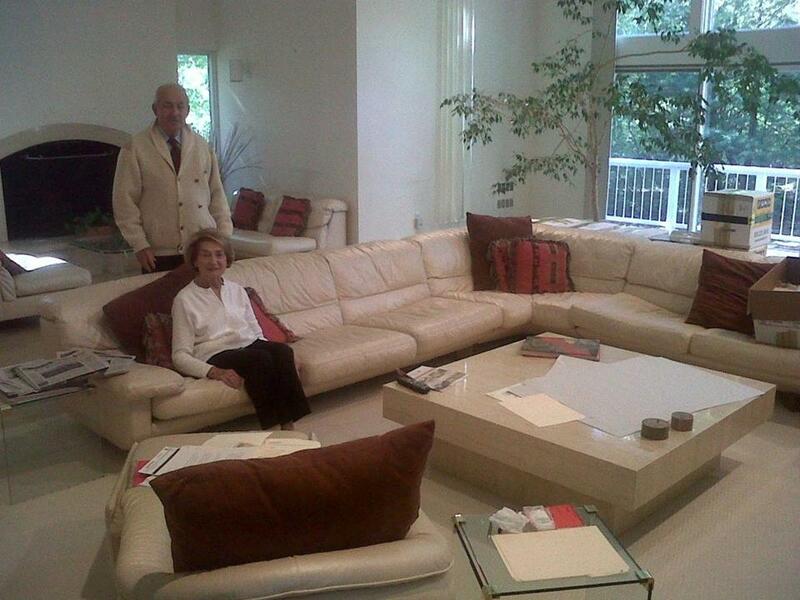 When my sister and I visited through the years with our spouses and children, we all gathered around the 24-foot long, L-shaped off-white leather couch in this enormous room. The last all-family event was Father’s Day 2011, when I cooked omelets to order. Soon after, my folks sold the house to downsize to The Commons in nearby Lincoln. Buyers Jeremy and Jody Kieval shared their plans to expand for greater comfort for their young family. No one could have predicted what happened three years later. General contractor Tom Silva with Mindy Pollack-Fusi in the great room. 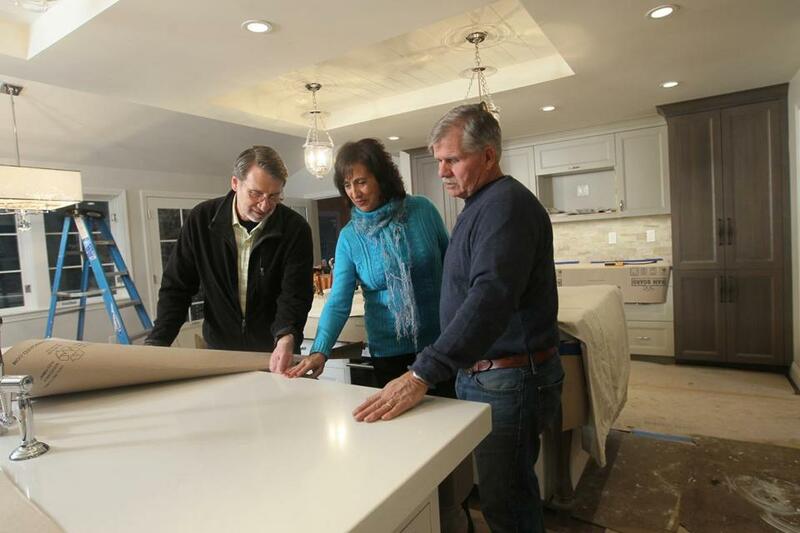 PBS’s “This Old House” chose the Kievals’ expansion for its 35th anniversary season. Just completed, it will premiere on WGBX Jan. 8 and on WGBH Jan. 17. Jeremy shared the news via e-mail last spring, writing: “PLEASE disregard the negative stuff. Got to have some entertainment value.” Hmm. Despite my parents’ updates, I guess their house was still a midcentury treasure needing major modernizing. Early on, my father and I ventured over to see the plans. I’ve returned a few times since. That tiny mudroom porch? Replaced by a bumped-out grand farmer’s porch spanning the entire front — making that front door no longer superfluous. In fact, it’s painful visualizing warm nights and martinis out there next summer — for another family. And, thanks to the bump-out, the Kievals enter directly from the garage, no fighting the elements like we did. Lucky them. My bedroom? The now-illegal laundry chute was removed for a hallway into the two-bedroom children’s suite above the garage — complete with bathroom and washer/dryer. A cozy guest room occupies what’s left of my bedroom. Mindy Pollack-Fusi with general contractor Tom Silva and master carpenter Norm Abram on the new porch. And me? I feel privileged watching my childhood home transformed — but with mixed emotions. So far, the one thing I find perplexing is swapping our gorgeous marble guest bathroom for a small home office — particularly because the replacement powder room’s avant-garde black wallpaper feels jarring — but perhaps my decorating ideas are as obsolete as an all-marble bathroom. Knowing this personal viewpoint would be revealed here, I recently asked master carpenter Norm Abram and general contractor Tom “Mr. Lexington” Silva for insight into the “negative stuff” Jeremy referenced. I figured my jab deserves a jib-jab. I found out our house was tired, worn out, old. Gee, after 45 years, so are my parents, my sister, and me. We could use a refurbishing, too. I also learned it was “underinsulated.” No wonder we were always freezing; maybe it wasn’t just Dad keeping the thermostats so low! 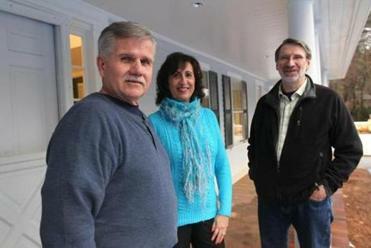 Stars Norm Abram (left) and Tom Silva of “This Old House” showed Mindy Pollack-Fusi around in the kitchen while it was under construction. And my parents’ designer wall unit in the great room that witnessed the myriad of special events held before it? “Carefully dismantled in large pieces,” said Silva, and sent to a recycling store. I won’t see the new one until I tune into the show. With my heart starting to sink, I asked after the 12-foot tall ficus tree in the great room that the Kievals had nurtured even during construction. I found it yellowing by the dumpster. And I looked over toward the trees that grew up in our front yard — now removed for new landscaping that will allow for more light and curb appeal. I’d seen enough. Time to leave. The writer back when the space had its original brown cabinets. Now we need to wait 15 episodes to see it all completed, but with every new photo, video, or TV ad for “The Lexington Project,” I grin as if I’m the diva, instead of my former house. Still, I suspect it will be like watching home movies with a horror twist: different actors — and suddenly a bunch of guys entering with crowbars and sledgehammers! Jeremy has soothed what pain lingers, reminding us they had “vision to alter an already great house, rather than tearing it down.” Good point. And they’re thrilled with the results. Perhaps my husband and I will drive by the house in warm weather and wave to the Kievals as they sit on the farmer’s porch. Or maybe if we’re lucky, we’ll be on the new homeowners’ party list and get to enter through the front door! But one thing I know for sure: Next spring we’ll drop off a hanging impatiens. Time for a new nest. Fifteen episodes on the Lexington Colonial project will begin airing on WGBX at 8 p.m. on Jan. 8 and on WGBH at 5 p.m. on Jan. 17. The program can also be viewed at www.thisoldhouse.com/watchtoh. Mindy Pollack-Fusi is a Globe correspondent and a college-application essay coach in Bedford. Send comments to mindy@theplaceforwords.com.